Despite my dislike of romance novels, here I am reading another one. Sigh. It is February after all, so I will not vomit on the overflow of love and mushiness going on lately. 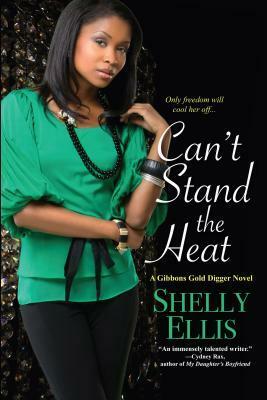 So, here we are on our next romance book, Can’t Stand the Heat by Shelly Ellis. The synopsis on the back of the book made me want to check this out, and despite all the books I already have checked out, and I do have a lot, I just wanted something light and entertaining. Let me tell you, it didn’t disappoint! I’m just on a roll here picking out entertaining books! The quick rundown: Lauren is a reformed gold digger; she’s finally fending for herself and not relying on a man to take care of her. You see, Lauren comes from a family of gold diggers, and she and her sisters have been taught to believe that men are only good for one thing, and we all know what that is and it ain’t love, honey. Lauren was doing well in the family business until her attorney ex-boyfriend crosses the line. Now on her own, she has bills up to her eyeballs. Nevertheless, she is determined to finally follow her own rules by being independent and not take money from a man. She also decides to not jump into a relationship so soon, but her rule is tested when she meets Cris, a newly retired football player. And Cris is rich and fine! Did I mention rich? Can Lauren finally become the woman she is meant to be and outrun her past and her jealous ex? Ok, ok. Fine. I admit it! Romance books aren’t that bad, well some of them anyway. I enjoyed this book and all the romantical stuff. Yeah, that’s not a word but whatever. I didn’t know what to expect, but again, I wasn’t disappointed. I like Lauren and her extra gold digging big sisters. They all have a story of their own and are just as entertaining. Let me add here that Stephanie and freaky deacon were hilarious. Freaky deacon. Need I say more? In short, I enjoyed this book. It features just the right amount of comedy and romance that will keep readers reading. Next up in this new series is The Player and the Game.